Lucas Salsagheti Gusanos - Hot Mexican Candy Straws Watermelon. Lucas Sweet'n sour hot Mexican candy straws with watermelon sauce - 12 count 1.05 oz each - net wt 12.6 oz. Hot Mexican candy sweet and sour straws by Lucas. 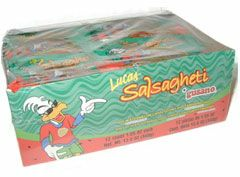 Lucas Salsaghetti are watermelon flavored hot candy strips that resemble spaghetti which is how they get their famous name, as well as the tangy tamarind sauce that is included so you can dip those yummy strips. Salsaghetti is a delicious mixture of sour, spicy and sweet, your tongue will be bursting with flavor and craving more of these addictively delicious treats. Lucas Salsaghetis - Salsageti - Salsaghetis - Salsaghetti - Salsagueti - Dulces Mexicanos aciditos y picosos marca Lucas. Lucas Salsaghetti son dulces enchilados en tiras con sabor a sandia que se parecen al spaghetti que es como obtuvieron su famoso nombre, ademas de la rica salsa con sabor a tamarindo que viene incluida para metas las tiras. Salsaghetti es una deliciosa combinacion de sabores agridulces y picosos, que hara tu lengua estar repleta de sabor y con antojo de mas de estas golosinas tan adictivas. Ships fast and good price for amount you recive. I love Salsagheti but its too expensive here...cheaper on other sites.